To have this keto-friendliest name yet serve those boneless hens between wheat buns is the biggest lie of the 21st century. But as a keto-addict, you know that these grainy hemispheres, toasted for extra crispiness and flavor, reveal their best taste when being dumped in a trashcan. Not only is Chick-fil-A trying to trick you with its name but also it’s deeply concerned about you practicing your math abilities. Refusing to provide any accurate nutrition for customized dishes, the entire chain is closed every Sunday as if giving you time to calculate it by yourself. At least, they generously created a nutritional list for buns, sauces, dressings, toppings, and regular dishes. But don’t rush to dust off your calculator, the math has already been done. If you want to know how to dine out at Chick-fil-A without breaking your keto macros, you just have to keep reading the brief guide below. If you’ve already skimmed the article about eating out at McDonald’s, you know the first rule of the keto club. That’s why everything you order must be served inside a bowl or at least in a carton box. And if you suddenly discover that precious chicken fillet trapped between two nasty buns, you’ve got to rescue it immediately. Gluten Free Bun. Gluten-free, but not carb-free. Dismiss. Multigrain Bun. Multigrain equals multi-bad, omit as well. White Bun. Nearly thirty grams of carbs per serving. Do not hesitate to throw it away. Biscuits, Bagels, Muffins. Superior names, inferior nutritional values. Keep them to feed the birds in the park. Cool Wraps. This bread was unlucky enough to be rolled into a pancake, so biting it would be too cruel. Cole Slaw. This cabbage and carrot blend looks perfectly suitable for keto, but it somehow contains 14 grams of sugar. Superfood Side. A mix of broccolini and kale with nuts and dried cherries. Superbad due to 16 grams of carbs. Greek Yogurt Parfait. The greek yogurt part sounds perfect, but the parfait one brings 27 grams of net carbs. 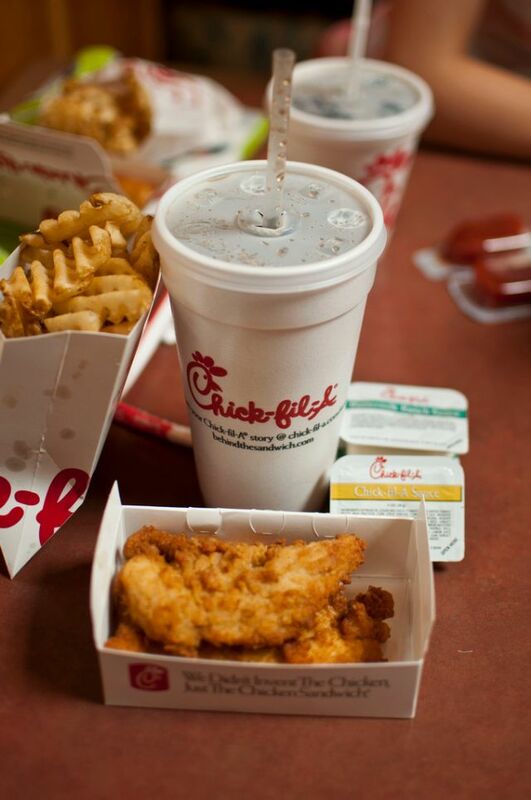 Chick-fil-A Nuggets and Chick-n-Strips. Unless you opt for the tiniest portions, which contain 5 and 7 grams of carbs respectively, you will clearly be at risk of breaking your ketosis. Fruit Cup. The smallest one contains 11 grams of net carbs. That’s too much for a 45-calorie bowl. Your keto-friendly order must not contain any of these dishes under any circumstances. Regarding the rest of the menu sections, it’s time to break those bowls down. Saying “bowls” wasn’t a mistake. Literally, every dish you order will be served in a cup because serving a burger without a bun is quite difficult without plastic tableware. As with any contemporary fast-food chain, Chick-fil-A has a separate menu for breakfast dishes which are usually served till 10:30 am. While the bun part is indifferent to true ketoers, adding eggs is great for the overall macros. Let’s see what options in this section are suitable for your diet. Egg White Grill. Half a grilled chicken breast with a hint of citrus flavor, folded egg white and a slice of American cheese atop that. Without a muffin it has about 150 calories with 5 grams of fat and 22 grams of protein. Bacon, Egg & Cheese Biscuit. Their famous renegade cows have no mercy for fellow pigs. Sans biscuit this burger provides approximately 200 calories, 13 grams of fat, 3 grams of net carbs and 16 grams of protein. Sausage, Egg & Cheese Muffin. Those cows are ruthless indeed. Anyway, without a muffin, it has about 360 calories, 30 grams of fat, 3 grams of total carbs, and 18 grams of protein. Not the largest variety of dishes, it’s still enough to avoid eating the same course every morning you decide to stop by. No worries if you’re late for breakfast, entree options are here to save the day. Remove an egg and stick in a lettuce leaf instead. Add two tomato slices and garnish with pickles. With a salad as a side, your lunch is ready to be served. Grilled Chicken Club Sandwich. Beneath that bun you’re about to throw away there’s a roasted chicken breast lying on a lettuce-tomato bed and covered with Colby Jack cheese and three bacon slices. Sans bread, it has 260 calories, 13.5 grams of fat, 4 grams of net carbs, and 26 grams of protein. Grilled Chicken Sandwich. The simpler version of the previous burger without cheese and bacon. Bunless, it provides 130 calories, 3.5 grams of fat, 4 grams of total carbs, and 23 grams of protein. Chicken Salad. Chopped signature chicken, celery, mayonnaise, and some unspecified relish. It has 350 calories, 24 grams of fat, 8 grams of total carbs, and 26 grams of protein. Quite keto-friendly at first glance, it only has 1 gram of fiber so the net carbs are a considerable 7 grams. That’s quite a lot for a 350-calorie dish, so be careful and don’t double it or combine it with breaded chicken nuggets or strips. Cobb Salad. You won’t need the insane level of skills Dom Cobb showed in the “Inception” movie to make this eponymous salad keto-friendly, but some “infiltration” is required. Ask to omit corn and tomatoes and swap breaded nuggets with grilled ones. Mission complete, behold those 322 calories, 18 grams of fat, 4 grams of net carbs, and 36 grams of protein. Speaking of those grilled nuggets you might use to alter the Cobb Salad recipe, they are worth mentioning in a separate section. Here is why. The cream of the crop, the only exception which is keto-friendly enough to be served in its own carton box without any modifications. Do not mistake it for Chick-fil-A nuggets, as the latter comes with high-carb breading. You can opt for either 4, 6, 8, or 12 bite-sized pieces of that roasted chicken. The smallest portion provides 70 calories, 1 gram of net carbs, 2 grams of fat, and 13 grams of protein; the largest one gives 210 calories, 3 grams of total carbs, 5 grams of fat, and 38 grams of protein. Portions in between provide proportionally increased or decreased amount of nutrients depending on its size. 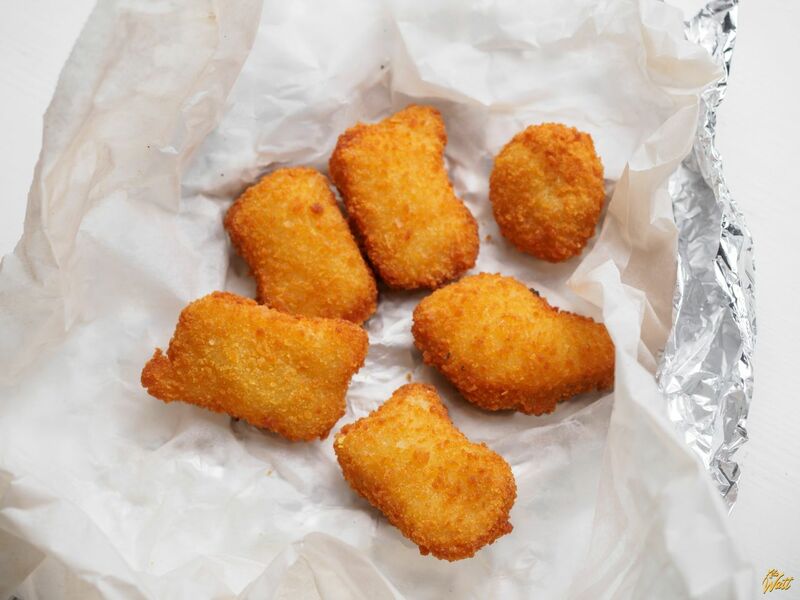 Are these nuggets keto-friendly? Hell yeah. Are they perfect for keto? Hell no. That’s because Chick-fil-A signature grilled chicken breast is significantly lower in fat than genuine keto dishes are expected to be. Luckily, fixing this issue is not rocket science. It is sauce science. Dipping sauces are a godsend to fix the main problem of the 21st century — dry and chewy chicken breast. Moreover, some of them are not only allowed in your diet but also boost important nutritional content. Numbers are per pack. Honey Roasted BBQ Sauce. Contains 60 calories and 5 grams of fat. Not the very best sauce in terms of nutrition, it surprisingly has only 3 grams of net carbs despite having “honey” in its name. Zesty Buffalo Sauce. With 25 calories, 2.5 grams of fat, and zero carbs this condiment poses no threat to your diet. Garlic & Herb Ranch Sauce. The absolute winner concerning being ketogenic. It provides a significant 140 calories coming from 14 grams of fat and 1 gram of carbohydrates. Other sauces contain about 10 grams of net carbs and thus are bad for your diet. 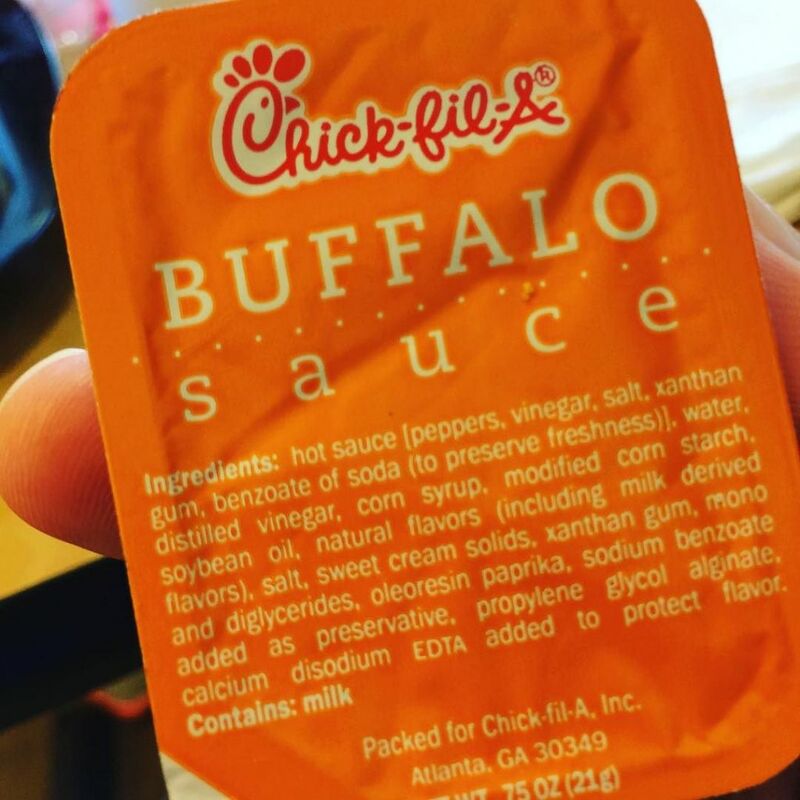 Their signature Chick-fil-A sauce has 13 grams of fat, which is good, but 6 grams of net carbs, which is bad. If you are tempted to try it, you might opt for a half-pack. What was the most important yet unmentioned skill Superman had? An ability to eat chicken breast without washing it down. Dipping sauces help to some extent, but unless you put on underwear over pants you might crave ordering a beverage. Dasani Bottled Water. Not much to add in here, water is water. Freshly-Brewed Iced Tea Unsweetened. Available in three sizes with zero nutritional value, it’s perfectly good for your diet. Coffee. Made of medium-roast hand-picked Colombian beans, this drink is available in both regular and caffeine-free versions. Either is fine, it only depends on your intention to be or not to be… caffeinated? Feel free to order any of those drinks. Unless you intend to test your superpowers, of course. Declared to be “the official chicken of Jesus”, which is doubtful because no wine was found in their menu section, Chick-fil-A is a relatively friendly place for keto-foodies. With their sales up by approximately 15 percent last year, who knows whether they could’ve reached the 20 percent mark if only they presented some low-carb options in their menu. Of course, they can serve bunless burgers in plastic bowls, but is it enough to satisfy contemporary low-carb cravings? Let’s leave this question open. The world is changing rapidly and Chick-fil-A might become the largest low-carb fast-food chain in the next five years. Or it might not. At least, you already know how to order a keto-friendly meal in here and have one more option to stave off your hunger while visiting a mall.